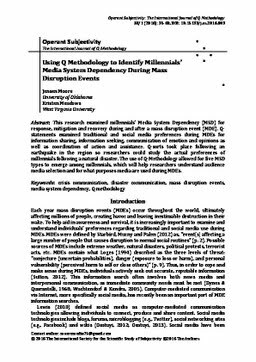 This research examined millennials’ Media System Dependency (MSD) for response, mitigation and recovery during and after a mass disruption event (MDE). Q- statements examined traditional and social media preferences during MDEs for information sharing, information seeking, communication of emotion and opinions as well as coordination of action and assistance. Q-sorts took place following an earthquake in the region so researchers could study the actual preferences of millennials following a natural disaster. The use of Q-Methodology allowed for five MSD types to emerge among millennials, which will help researchers understand audience media selection and for what purposes media are used during MDEs.